We live in a broken world. You don’t have to look far to see that things are not what God made them to be in the Garden of Eden. It could be a terminal or debilitating illness, loss of loved ones, difficulties with those around you, inability to find a job, or haunted by your past from the sin and failures of yourself or others towards you, we all face troubles and trials in this world. And how you deal with those trials depends less on the trial itself and more on how you approach them. Put another way, it is not what you face, but how you face it that matters most. That’s because regardless of the size and difficulty of the trial – Jesus is always bigger. That means that the battle is not won and lost in dealing with the trial itself, but in whether we will turn to and trust Jesus in us to handle the trial. And while that is a simple explanation, the application is anything but. Depending on the trial, my first reaction is not always turning to Jesus, especially if the trial is somehow related to things in my past that have left a wound on my soul. But it is in these moments where Jesus is doing His greatest miracle of healing – He is sanctifying me. We often think of sanctification as the process where we sin less and live more upright lives. And while that will happen as a result of Jesus’ work in our soul, that is not His primary goal. It is something much greater. 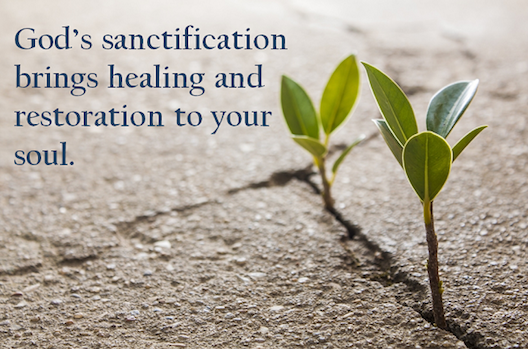 His goal of sanctification is to bring healing to my soul, which has been damaged by this broken world. The damage being the lies and mistrust that our enemy bombards us with. Lies that I believe to be true as a result of the disappointments and hurts that I have and am experiencing. It is from these lies that our enemy provokes us to choosing to live out of the flesh, to try and find comfort and strength somewhere other than God. So Jesus, after exposing the lies to be just that, lies, He begins to tell us the truth. The truth about Himself, that He is a God that loves us fully, deeply and completely with a love that never changes regardless of my behaviour, either good or bad. It is a love that already knows about every single one of my past and future mistakes, but accepts me and wants me anyways. He tells me the truth about myself, that while I may not yet live as I want to, I am still His beloved, holy and righteous child. That the old me was crucified with Him and now I am a brand new creation that has been forever united to Father, Son and Holy Spirit. That He is proud of me and nothing can ever change that. Absolutely nothing, not even me. He tells me the truth that while the circumstances that I face are difficult, challenging and would cause many brave souls to lose hope, He lives in me to face it alongside me. That I do not have to battle with trouble in my own strength, but with the strength of God who has proven to be stronger and greater than giants, lions, entire armies and even death itself. Armed with the truth, I can begin to make better choices in life, the best and most important of all is to trust the One who loves me. This is the work of sanctification and healing that Jesus is doing inside of me and you right now. And notice that it is His work. (see Philippians 1:6 and 1 Thessalonians 5:23-24) My work is to believe Him, to listen to Him, to trust Him. And as He works in me, my trust in Him grows. HAVE YOU EVER THOUGHT ABOUT HOW GOD BECAME YOUR FATHER? It’s not just a nice phrase or a word picture to help you understand Him as Creator or as Lord. If you have the Spirit of God dwelling inside you, if He is leading your life, you are a child of God. An actual child of God. How is this possible? What makes a son or a daughter a son or a daughter? Is it DNA? Is it a shared nose? Or is it something else? We see the same Trinity in this passage as we did when Jesus was baptized. This time, though, the Spirit is bearing witness to the legitimacy of us being God’s children, paving the way for us to approach God as our Father, our Dad. And Jesus, the Son, sharing His inheritance. We are physically born into sin, and fear, and death. But as Christians, we are spiritually reborn (not receiving the spirit of slavery to fall back into the fear that so often cripples us). Instead, we are adopted as His children. The Spirit certifies God as our adopted Father, and we are welcomed into the family by His Son, Jesus, as coheirs. Rest in this. Do not fear. Happy Father’s Day. Randall Payleitner is the Editorial Director at Moody Publishers. He writes semi-regularly at www.SmartPeopleReadBooks.com. This year Randall will be celebrating his first Father’s Day since becoming a dad—he and his wife Rachel welcomed their two-year-old into their family, as their son, this past September. I once was lost, but now am found was blind but now I sec. ‘Twas grace that wrote my name in life’s eternal book. ‘Twas grace that gave me to the Lamb who all my sorrows took. Grace was enormously expensive for God. Yet there’s nothing we can offer to pay for it. Any concept of grace that makes us feel more comfortable about sinning is not Biblical grace. God’s grace never encourages us to live in sin; on the contrary, it empowers us to say No to sin and Yes to Truth. The question is not what arc we to do and not do, but is God pleased and magnified. It is not about us; it is all about Him. It has been a tremendous privilege to sec what God has done by His grace. We will never fully understand the grace of God. “May the God of all grace, who called us to His eternal glory by Christ Jesus, perfect, establish, strengthen and settle you” (I Pet. 5:10). Many have a deep longing for a more intimate and personal relationship to the God of grace. God has always expressed His grace through the ages; but now grace reigns. He is more ready to express His grace than His judgment. “And God is able to make all grace abound toward you, that you always having all sufficiency in all things, may have an abundance for every good work” (II Cor. 9:8). “To the praise of the glory of His grace, by which He made us accepted in the Beloved (Christ) ” (Eph. 1:6). We need to praise the Lord abundantly for His wonderful grace. Grace is God’s favor to those that deserve loss, but put their trust in Him. However, where there is pride, there is no room for grace. Martin Lloyd Jones shares: “What I am interested in is not what I was but what I am, and I am what I am by the grace of God.” Christ became poor so that wc might become eternally rich. This is the high cost of grace. God’s grace is amazing because it is free. He bore the cost of our sins; therefore, it is not cheap grace. God’s grace is amazing because it is limitless. His grace can never be exhausted. Regardless of the vilest or number of our sins, God’s grace is always sufficient. Grace is not about God lowering His standards; it’s about surrendering to Christ and allowing Him to meet those standards through us. It is hard for us to realize that all that we are, all that we have and all that we will ever be is because of God’s grace. God’s standards of holiness are not lowered under grace; they arc raised (Matt. 5:20-22; Gal. 5:4). Grace does not make believers less holy; it enables them to be more holy. Grace never causes believers to despise and avoid truth; it causes them to adore and practice truth. Grace does not lower the bar; it enables us to jump over the bar. You guessed it! Our hearts arc really thrilled because of God’s love for us and His GRACE toward us. …Please continue to pray for this ministry. Most importantly, He is sufficient to be fully trusted.